As an industry leader in energy efficiency, Hunter Douglas is known for their quality honeycomb shades. Truly the next generation of honeycomb shades, the newly redesigned Duette® Honeycomb Shades have specially constructed air pockets in the window treatments to trap cold or hot air coming in from the window and prevents temperature fluctuations inside your home. This helps prevent rooms from feeling drafty, keeping you warmer in the winter and cooler in the summer, and reducing the workload of your home’s heating and cooling systems, extending their service life and cutting energy costs. These shades are available in single or double cell options, allowing you to choose the right amount of insulation for your home. Along with choices in single or double layers of cells and cell sizes, Duette® Honeycomb Shades are available in horizontal and vertical operating system options, making it simple to coordinate sliding glass doors and large windows with the rest of your room. 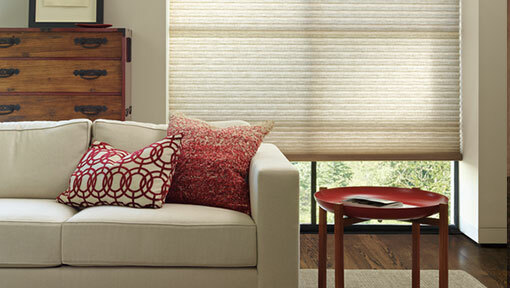 Tailor your Duette® Honeycomb Shades to your style and everyday needs. You can choose from a variety of fabrics, ranging from sheer to opaque, many options when it comes to pleat sizes, and multiple corded and cordless lifting system options. At Home Designs invites you to stop by their Hunter Douglas Gallery Showroom in Hockessin, Delaware to try out Duette® Honeycomb Shades on display. Hunter Douglas is not only the industry leader in energy efficiency and quality, but also in safety and convenience. The latest innovation from Hunter Douglas, this wireless system gives you the ability to control your window treatments from the comfort of your couch or from your desk at work all with the touch of a button on your smart device. Schedule your shades to adjust at specific times during the day so you don’t have to give them a second thought. This lift system gives you light control and privacy in a cordless system. Lower the top half to let natural light in, while keeping the bottom half closed, keeping prying eyes out. All without worrying about dangling cords. This is a cordless lifting system, designed with the safety of children and pets in mind. Easily raise and lower shades using a handle located the bottom of the shade. Also designed for safety, the UltraGlide® operating system features a retractable cord to open and close shades. The cord always remains the same length, keeping it well out of the reach of small children. Featuring a continuous cord loop affixed to the window frame, EasyRise eliminates the needs to wrap dangling cords to keep them away from children and pets, because the loop is always the same length regardless of shade position. This operating system is perfect for very large windows and skylights. Available with PowerView® Motorization or manual operation options, SkyLift™ is a great choice for light control in rooms with skylights. This vertical pleat operating system slides easily from side to side without cords, making it an ideal solution for sliding glass doors. This system opens honeycomb shades with a standard pull cord that locks into the position of your choosing. Increase energy efficiency with Hunter Douglas’s patented honeycomb-within-honeycomb design. 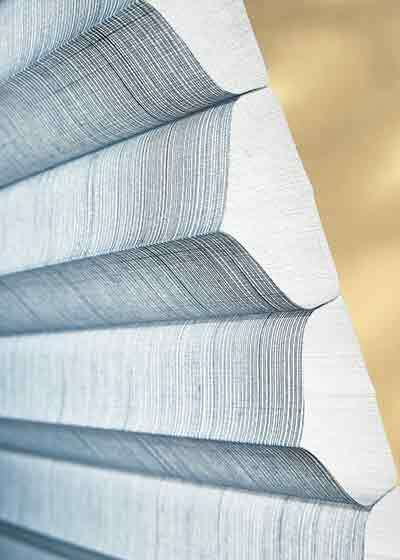 Learn more about Duette® Architella® Honeycomb Shades.